Studies show that work/life programs can help improve employee engagement and productivity. But you may believe effective strategies are expensive and require a big-business budget. “Autonomy day.” Employees at G5, an Oregon-based software firm, have an annual “autonomy day” to pursue any project they want—from developing new products to researching new lunch spots. Encouraging volunteerism. UnitedHealthcare hosts VolunteerMatch, an online database of volunteer roles that employees can search by entering their location and type of service they’re interested in. New experiences, new stories. A New York-based PR firm, Weber Shandwick, gives certain employees a stipend and extra paid week off to experience a new activity that enriches them professionally and personally. Participants contribute to a blog so they can share their experience with colleagues. Advice for parents-to-be. Professional services firm KPMG hosts a “My 9 Months” website that offers information, articles and other insights for expectant parents. Lunch and learn. First Insurance Company offers free “Balance Life” events in which experts speak on wellness, health, family, finances and other issues. Personalized perks. Managers at Hilcorp Energy are given leeway (and a budget) to reward employees with personalized bonuses. These have included everything from horseback riding trips to horseshoe throwing lessons. No travel, no problem. In an industry that typically requires lots of travel, a Seattle-based consulting firm, Slalom Consulting, guarantees employees that all their clients will be local if they want that. Family affair. Chicago-based cleaning manufacturer PortionPac has several siblings work side-by-side with parents. Workers at the 84-employee company can flex their schedules around family obligations. The company even changed the start and end times of its day shift—at employees’ request—so workers could clock out by 3:30 to get kids off the bus. Vegging out. During lunch breaks, employees at Southern Ohio Medical Center can plant and pick tomatoes, kale, broccoli, strawberries and more in the employees’ own garden. 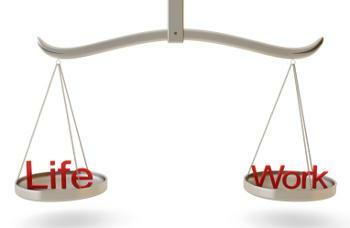 There’s only so much an organization can do to help employees with their work/life balance. Some of it has to be up to them. As flextime and flex-place have taken hold in organizations, employees are more responsible to determine for themselves how their wellness, personal relationships, personal lives, finances, job skills, networking and the other pieces of their days and their lives fit into or around their work time. As an HR professional, you’re in a position to partner with employees when it comes to work/life balance. Teach employees how to manage these competing demands that lead to feelings of being overwhelmed, stressed, unhealthy and unproductive. That will help your organization accomplish what it needs to get done. What I’ve discovered in my research is that most of us don’t know how to figure that out. It’s a modern skill set that we all need, but few of us have. I have studied the habits of the rare people I consider to be work/life “naturals.” They seem to intuitively and seamlessly fit their work and personal life together. They’re not overwhelmed by the competing demands. 1. They believe they have to manage their own, everyday work/life balance. They don’t wait for someone else to tell them what to do. 2. They keep a single calendar that combines personal and work to-dos. They see every day as a complete picture, and they consider both professional and personal obligations before making a commitment on either side. 3. They constantly reflect, and they schedule time for reflection into their week. They think about what they want, what’s missing, what they’d like to do less of or more of. They make time to stay in touch with themselves. 4. They take steps to remedy imbalance—one step at a time. When they see a gap between what they want to do and what they’re actually doing, they fix it. If they’re neglecting friends, for example, they schedule lunch. They’re flexible enough to fit those things into their schedules. 5. They celebrate their successes. They don’t obsess about what they didn’t get done in a week. They congratulate themselves for what they did. Every single employee of every single company needs to know how to take these kinds of baseline actions to manage competing work and personal demands. Contributor: Cali Williams Yost, CEO of the work/life flexibility strategy firm Flex+Strategy Group and author of the new book Tweak It: Make What Matters to You Happen Every Day. Contact at www.worklifefit.com.